One voice, one guitar and a box of tricks makes the Blues shiver and shake. I can’t think of a more suitable opening track than Rufus Thomas’ Bear Cat (which owes a lot to Hound Dog!) to open LOOPY, and Bloaters whisky soaked rasp and gutsy electric guitar playing make it very much his own; as he does again, later with a scary interpretation of Leiber and Stoller’s Alligator Wine. The fact that those two great songs don’t really stand out proves what a clever songwriter and performer Bloater is; starting with Every Path Has Its Puddle which opens with his guitar creating a thunderclap followed by the Box of Tricks keeping the atmosphere dark and moody as the singer begs ‘her’ for a ‘kiss and a cuddle/but every path has it’s puddle/a pretty girl like you is going to get me in trouble.’ This, for me, is a song that epitimises The Blues. As the album cranks on tracks like Pallbearers Song and More than a Million are so raw in their delivery I swear that I could see blood seeping out of my speakers. I’m not sure what purists and pedants will make of the Loop machine that is used throughout the album but I absolutely love the way Bloater uses it to breathe new life into a Classic formula; especially on his signature tune Double Whammy making it sound like something you would have heard in a Louisiana Juke Joint on a Saturday night instead of the R&B Rocker that fans will be used to. It’s a similar story with the funky Only Fools Know Everything and You Don’t Know Diddley which sounds like something Bo himself would have been proud of in his latter years. 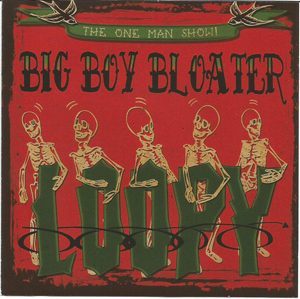 Even as a fan of Big Boy Bloater I’ve been pleasantly surprised by the sound he’s created here and it certainly is a sound that I haven’t heard in a very long time.